Countless legends have arisen around the person of St. Ursula of Cologne. Many tell the story of the 11,000 women who accompanied Ursula, the pious daughter of the king of Britanny, on her pilgrimage to Rome. On their return journey they came across a horde of Huns who were beseiging the town of Cologne, albeit without success. This warlike tribe were now bored and frustrated and to pass the time attacked the women and slaughtered every one of them. After this massacre the Huns returned home and the people of Cologne, relieved to be saved, were left to bury the remains of the women. The city emblem of Cologne contains 11 black flames or drops to symbolise these 11,000 women. We do not know whether the sum of 11,000 is historical fact or due to exaggeration on the part of the citizens of Cologne, but nevertheless this tale is central to the legend of St. Ursula. We are taking the figure 11,000 as a reality for our art project and aim to collect 11,000 handerchiefs from women of today. Each woman taking part is asked to sign her name in ball-tip or embroider it on the handkerchief. 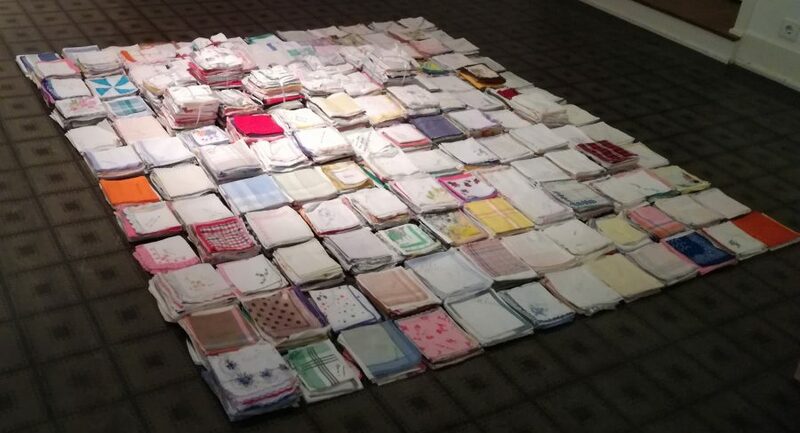 This process of collecting is most likely to take a number of years and will be documented in exhibitions.